The use of clothing as a means of sun protection has been recommended in recent education campaigns. Contrary to popular opinion, however, some fabrics provide insufficient ultraviolet (UV) protection. We investigated 236 apparel textiles of the spring/summer collections 2000 and 2001. In accordance with the forthcoming European standard the UV protection factor (UPF) of the fabrics was determined spectrophotometrically. 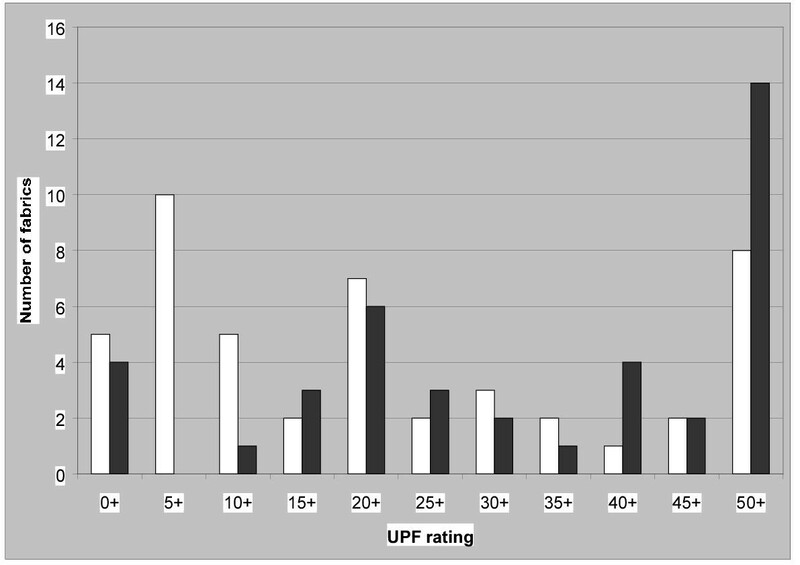 Seventy-eight (33%) fabrics had UPF < 15, 45 (19%) had UPF = or > 15 and < 30, and 113 (48%) had UPF = or > 30 (30+). More than 70% of the wool, polyester, and fabric blends, and only less than 30% of the cotton, linen, and viscose fabrics had UPF values of 30+. Fabrics with black, navy-blue, white, green, or beige colours provided most frequently UPF values of 30+. It is difficult for the sun-aware consumer to choose the 'right' garment, with a third of summer clothing providing insufficient UV protection and only half of the fabrics having UPF 30+, the UPF recommended by the European standard. Therefore, apparel summer fabrics should be measured and labelled in accordance with a standard document. The incidence of skin cancer has been increasing at an alarming rate over the past several decades. While there are many factors involved in the onset of melanoma and non-melanoma skin cancers, overexposure to ultraviolet radiation (UVR) has clearly been identified as an important factor. High levels of exposure in childhood have been associated with greater proneness to develop skin cancer. Whether this is due to the skin being particularly sensitive to sunlight in childhood or due to a large proportion of total lifetime dose accumulating over this period is not known, as most of a lifetime of UV exposure occurs during childhood and adolescence [1, 2]. In the past few decades, sun protection campaigns have been initiated in Australia, the United States, and Europe to educate the population about sensible behaviour in the sun. These campaigns, principally targeted towards the protection of children, tried to change attitudes regarding the idealisation of the darker complexion and the status symbol of tanned skin. Apart from avoidance of the sun, especially at peak hours, the most frequently used form of UV protection is the application of sunscreens. Since suitable clothing offers usually simple and effective broadband protection against the sun, the use of fabrics has been highlighted in recent education campaigns. Contrary to popular opinion, however, some fabrics provide insufficient UV protection . We conducted a study on a great number of commercial apparel fabrics designed for recent spring/summer collections. We investigated 236 apparel fabrics of the spring/summer collections 2000 and 2001. The fabrics were provided by a leading European garment manufacturer (Klaus Steilmann GmbH & Co. KG, Bochum, Germany). The mean ± SD weight of the fabrics was 158 ± 51,5 g/m2 (range: 39–275 g/m2). In accordance with the forthcoming European standard  the UV protection factor (UPF) of the fabrics was determined spectrophotometrically in the laboratory as it has previously been described in detail [5, 6]. Correspondingly, the fabrics were investigated unstretched and in dry condition . In short, we used a Cary 500 UV/Vis/NIR spectrophotometer (Varian Deutschland GmbH, Darmstadt, Germany). Direct and diffuse UV transmission was assessed with the aid of an integrating sphere. In order to minimize any measurement error that might be caused by fluorescent properties of the fabrics a UG-11 filter (Schott, Mainz, Germany) was used. The spectrophotometric measurements were carried out in the wavelength range of 290–400 nm in 1 nm steps. With the aid of a computer-controlled autosampler, the fabric samples (3 × 4 cm) were transported from the sample magazine into the measurement position in front of the integrating sphere [6, 7]. Four samples of each fabric were investigated. So, 16 single measurements both in machine and cross-machine directions were performed for each fabric. To determine the UPF, the spectral irradiance (both source and transmitted spectrum) was weighted against the erythema action spectrum proposed by the CIE. For each sample of a fabric, a mean UPF value was calculated, and the lowest of the 4 samples was considered the in vitro UPF of the fabric . The UPF was rated as follows: 0+ (UPF <5); 5+ (5 ≤ UPF < 10); 10+ (10 ≤ UPF < 15); … 50+ (UPF ≥ 50). 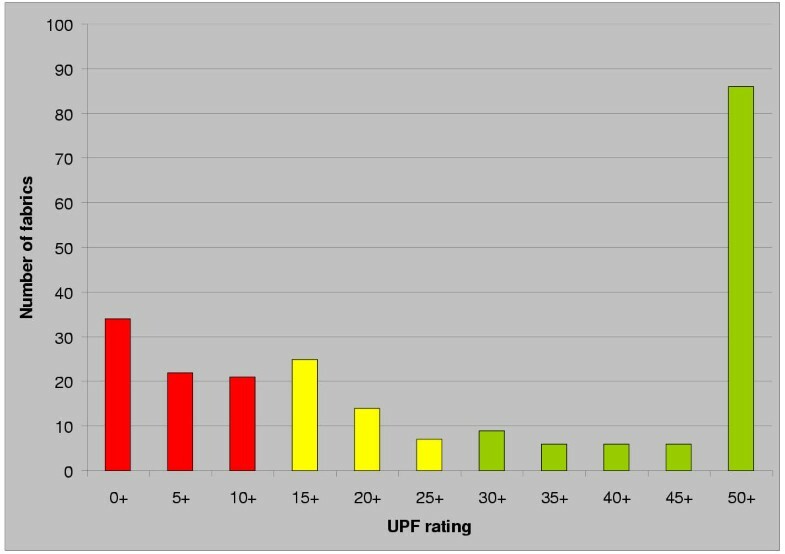 As shown in Figure 1, 78 (33%) fabrics had UPF <15 (red), 45 (19%) had UPF ≥ 15 and < 30 (yellow), and 113 (48%) had UPF ≥ 30 (green). More than 70% of the wool, polyester, and fabric blends, and less than 30% of the cotton, linen, and viscose fabrics had UPF values of 30+ (Tab. 1). Fabrics with black, navy-blue, white, green, or beige colours provided most frequently UPF values of 30+. Detailed data of white and black fabrics are shown in Figure 2. As parameters are rarely independent, systematic research to quantify the effect of various manufacturing methods is difficult. The UPF of a garment depends on a number of factors, including fabric construction, type, colour, weight, thickness, finishing processes, and presence of additives such as UV absorbing substances (e.g., titan dioxide, brightening agents), etc. Moreover, the UV protection provided by a garment during use depends on wash and wear, including stretch and wetness . Thus, the UPF of a fabric is influenced by fabric properties and the complexity of interaction between these properties makes it impossible to predict the UPF or to generalize comparison between e.g. cotton vs polyester (Tab. 1) or black vs white (Fig. 2), nor is it sufficient to hold a fabric to the light and assess the amount of light seen through the spaces. The aim of the presented study was to investigate UV protective properties of typical summer fabrics that are currently available on the market. Although it was not possible to study the parameters independently we have demonstrated the following trends. Polyester and wool fabrics usually provide sufficient UV protection (UPF 30+), while other fabrics, such as cotton, linen, and viscose, frequently offer poor UV protection. 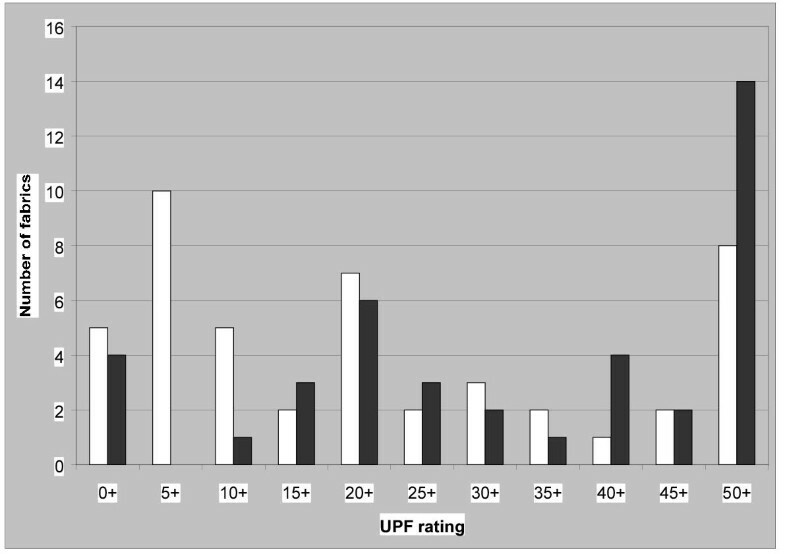 We showed that dark-coloured fabrics frequently have UPF values of 30+. Nevertheless, also white fabrics may provide sufficient UV protection depending on other parameters such as tightness of weave and fibre type. The most striking result however is the fact that 78 fabrics (33%) have an insufficient UPF of less than 15, and only 113 fabrics (48%) fulfilled the requirements of the European standard for UV protective clothing, that is UPF 30+ . Similar results have been found in previous studies performed in Switzerland, Germany, and Australia [8–10]. The question arises, how would the sun-aware consumer be able to choose the 'right' garment, with a third of summer clothes providing insufficient protection and only about a half of the fabrics providing UPF 30+ as recommended by the forthcoming European standard, respectively?! Therefore, UV protection of apparel fabrics should be measured and labelled in accordance with a standard document. This is especially true for children's clothing. A UPF of 30+ may be resistant against the effects of stretch, wetness, and environmental stresses. Besides, UPF values obtained by measurements in real exposure situations are usually higher than those obtained by conventional laboratory testing which represents a 'worst-case scenario' (11–13). Apart from a sufficiently high UPF the design of the garment is the crucial factor in sun protection by clothing. The European standard  includes therefore the following stringent requirements for the design of garments: 1) clothing designed to offer UV protection to the upper body must provide at least coverage from the base of the neck down to the hip and across the shoulders down to three quarters of the upper arm 2) clothing designed to offer protection of the lower body (from the waist to below the patella) must similarly provide complete coverage (Fig. 3). In reality, in European countries such as Germany there is only a market for children's UV protective clothing. 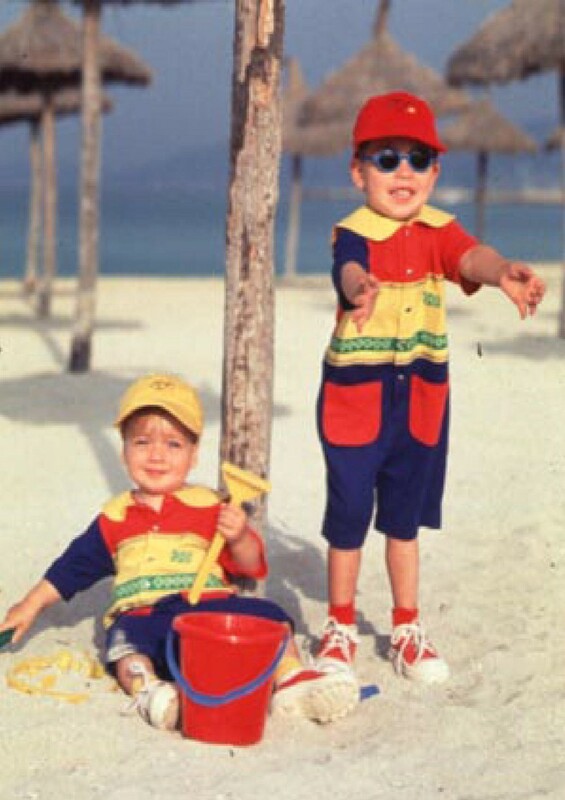 Correspondingly, there are only a few manufacturers and traders in Germany dealing UV protective clothing and most of them provide exclusively UV protective clothing for children. By contrast in Australia, which has considerably higher levels of solar UV radiation and higher incidences of skin cancer, State Cancer Councils sell sunscreens, sunglasses, hats, and UV protective clothing to the public at a reasonable cost – an important attempt to widen their use [9, 10]. Commercial summer fabrics frequently provide insufficient UV protection. Since it is difficult for the sun-aware consumer to choose the 'right' UV protective garment, apparel summer fabrics should be measured and labelled in accordance with a standard document. We are very grateful to Mr Roger Schmidt (Klaus Steilmann Institut für Innovation und Umwelt GmbH, Bochum-Wattenscheid, Germany) who provided us the fabric materials for the measurements. This study was supported in part by grant 07UVB60A/2 from the German Ministry of Science and Technology.